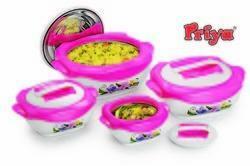 We are the renowned manufacturer and supplier of best range of Plastic Hot Pot Set. 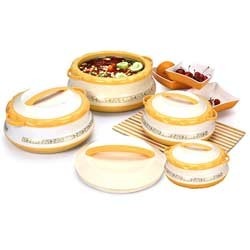 These delight hot pot sets are highly admired by our wide clientele due to its superior durability, large capacity, smooth and easy to clean container which provides excellent insulation. In order to fulfill the ever changing demands of our clients, we have been engaged in manufacturing, supplying and exporting high quality Plastic Hot Pot Set. The offered spectrum of pots is designed in a vintage style for giving a graceful look. These hot pots keep the food warm for a longer time. Besides, these can be carried for picnics and long road trips. 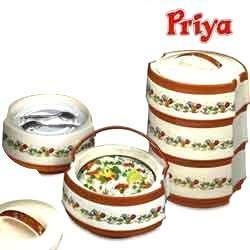 Keeping in sync with the times, we are engaged in manufacturing, supplying and exporting high quality Plastic Hot Pot Set. The offered hots have chrome plating and foiling and their insulation is maximum owing to its unique shape. Our experts use cent percent food grade virgin plastic in the manufacturing process. These pots have shiny silver ring that adds to their vintage look. 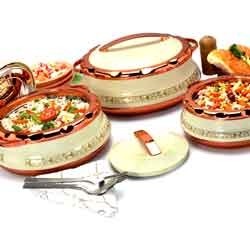 With our expertise in this domain, we are able to manufacture, supply and export a superior quality Plastic Hot Pot Set. The maximum amount of insulation in our pots keeps the food warmer for a longer time period. Also, our range has maximum heat retention properties due to the gap between the steel and plastic inside the lid. Packaging Details: Each piece packed in a poly bad, one set packed in a strong 5 ply printed laminated box, six such boxes packed in a 5 ply outer shipper master carton. Engaged as manufacturer, supplier and exporter, we are engaged in offering our customers with a wide range of Plastic Hot Pot Set. Can be utilized to take them for picnics, office, outdoor barbeques, get together and keeping on the table. Perfect and graceful, these warmers are oval in shape and appreciated among our customers for marvelous designs. Packaging Details: each piece packed in a transparent plastic bag, each piece packed in a printed strong box and 6 pieces packed in an outer carton. 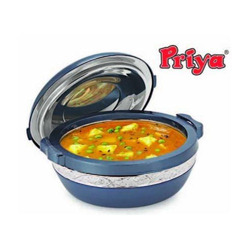 We are the stalwarts in manufacturing, supplying and exporting an extensive array of Plastic Hot Pot Set Manufactured using high quality food grade plastic, these products are used for cooking and serving food. These regular hot pots are offered by us in a spectrum of colors, designs and sizes at nominal prices. We manufacture, supply and export a premium quality range of Plastic Hot Pot Set. The offered product-line is manufactured under the strict surveillance of our skilled professionals. Post-production, we inspect these products on certain well-defined parameters of quality to ensure zero-defect. Our clients can avail from us quality approved Plastic Hot Pot Set. To manufacture these products, we make sure that optimum-grade material is used in the manufacturing process. These products are available with gold and silver plated rings. Furthermore, we can avail these products in a variety of colors, designs and capacities at industry leading prices. 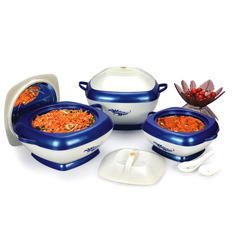 We are counted among the leading manufacturers, suppliers and exporters of a qualitative range of Plastic Hot Pot Set. These products are made under under the strict surveillance of our experienced professionals at our multifaceted manufacturing facility. Customers can avail our range at industry leading prices in various specifications. With firm commitment to quality, we are manufacturing, supplying and exporting a comprehensive range of Plastic Hot Pot Set. The range we offer is manufactured using high-quality material so that these are in adherence with international quality standards. Post-manufacturing, our range is stringently inspected on certain parameters of quality so as to ensure its flawlessness. Moreover, we offer our range in variegated specifications. 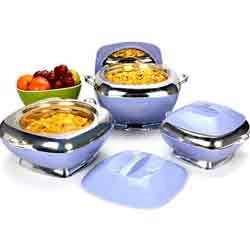 Fluidic hot pot set of 4 pcs. is a very fast moving product in the Export market. 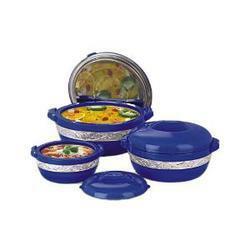 We have seen tremendous appreciation for the design and storage capacity of fluid casserole. This product comes in various colours and has set a trend in the market. Trouble free product with very attractive colours. 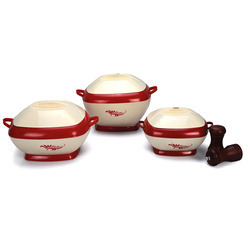 Fiesta hot pot set has this unique design in the middle having silver and golden finish. The finish is unremovable and not harmful. This product has a wide vareity of colours and can be customized as per buyer and country requirement.